The world of the 21st century has come and gone by way of cosmic cataclysm, but unlike the dinosaurs and other victims of global extinction events, humanity managed to survive and reorganize into a functional society a millennia later. Not without help, though, as some suppose the supernatural or extraterrestrial may have had a hand in developing the utopic post-apocalyptic world. The 31st-century editor, however, strongly doubts the veracity of these claims , but as I've recently discovered, there's more truth to these claims than I'd been led to believe. This story has a fascinating premise with a marvelous setup describing the power and functionality of myth and an editor that acknowledges the seeds of truth from which myth can spring, while resisting belief in the more obnoxious supernatural fallacies that make something truly mythical. The framework for this compilation of myths is extremely convincing. 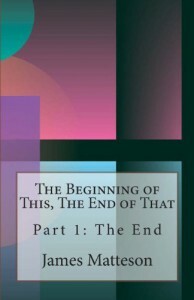 The editor's voice is spot on, both dubious of the myths he has assembled while acknowledging they must have come from somewhere, and the quotations selected by author Matteson are well chosen and display topical erudition that lends credence to the expectation that the tales will be well-formed. I am sadly not well versed enough in Nordic mythology and that of northern Europe to identify the many references to the Poetic and Prose Eddas found in the chapter titles, or Nordic myths found elsewhere, as there surely are. Those familiar with them are likely to take more from these stories, see the connections and implications they make, and better appreciate them. With that in mind, the foreignness of the work appealed to me--a direct consequence of my ignorance. All around me droplets of information fell, and every so often I recognized the notes they struck upon the ground. A wealth of references to worldwide theologies abounded, and every once in a while I was able to tie something I recognized to something I did not, which gave me the impression that comprehension was only a few inches out of my grasp. This in itself was a good reason to continue on. to hide yourself from the fearsome fire. I will send you to the wilderness. I will I will I will I am the Flying Man. Here we have an amalgamation of references from Buddhist, Greek, Egyptian, Christian, Judaism, and other theologies I likely was not able to identify, as well as locations, psychological archetypes, etc., all essentially stating "I am a messenger from the Gods, a teacher, and an artisan; you are the clay." After picking through this dense knotting, it seems fairly clear Flying Man is a direct reference to Hermes. Without an understanding of any of these references, it's gibberish. Add a rhyme scheme to it and you have something straight out of Alice in Wonderland (minus the mathematical undertones). Add a cause to it and you might end up with a book by Ted Geisel. In a metafictional sense, Matteson could not have chosen a truer opening quote with: "In a senseless world, a myth makes sense of nonsense." Knowledge tends to dispel myth with sense, but knowledge of myths is helpful in making sense of this long stream of information. I am by no means a critic of cryptic gibberish. When I can pull off a bit of nonsense in my own work that, in the proper context or with a second read, makes sense, I feel gratified by a fleeting sense of genius. In short, Matteson knows his stuff and it would be helpful if you knew it, too. For me, the lone drawback was not the layers upon layers of information, nor the myths themselves, but perhaps the execution of them and the description of the characters within them. Where the editor's remarks were sharp and professional, the myths in the telling were not as crisp and tended to provide information rather than let it flow along with the plot. The characters were oddly functionally observational at times, making leaps of cognition in their dialogue that turned them into narrators rather than participants in a story, and coming across as strangely detached from events taking place around them that were at times so surreal and bizarre they would have terrified any normal person. This might be a pithy complaint considering the greater volume of myth is conveyed in extremely tedious detail designed to move the story forward, but as a matter of preference a character more fully engaged in their world is more compelling. For example, you might tell me Bruno is seven feet tall and likes to eat cheese, but this paints a dispassionate picture of Bruno--he is a block of wood. Or you could describe Bruno hunching through a doorway, one hand pressing a block of cheese into his mouth while the other fished eagerly through a pocket in search of more. Fussing aside, this is a story I liked. I might have liked it more had the characters been more real to me, but making the story more character driven would probably deemphasize the mythmaking, which was the best part of the story. As a fan of history and myth, this book is plenty good. I would undoubtedly benefit from a second read, and possibly a third, to understand the content more fully. While I haven't re-read a book in a long, long time, I have a file set aside in my mind that I will revisit with any new knowledge and hold it up to the kaleidoscope of my brain to see what the book looks like through each new facet. In terms of ambition alone, this story easily warrants a five-star rating.